The Alltech 2014 WEG logo. As our Facebook pages and email inboxes fill up with news, results and photos from the 2014 World Equestrian Games (WEG), a brief look on how and why these games came to be is timely. 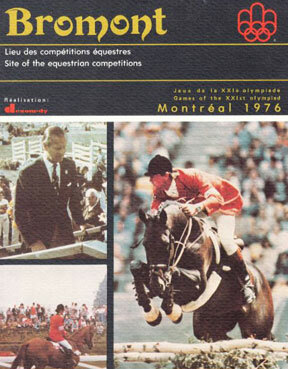 Pre-1990, the FEI disciplines each held their own annual championship. Finally after much discussion that started way back in the 1980s, it was decided to unite all into one championships in one venue to be held every four years between Olympic Games. While initially the WEGs were held in Europe: Stockholm, Sweden; The Hague, Netherlands; Rome, Italy; Jerez de la Frontera, Spain and Aachen, Gemany, finally, in 2010, the Games moved across the pond and were held in Lexington, Kentucky with Alltech, an animal food and nutrition company, as the sponsor. Stockholm, Sweden was awarded the first WEGs and it was decided to use the stadium from the 1912 Olympics as the main arena with obvious changes and upgrades. These WEGs were a huge success thanks to the intricate planning, great weather, help from the Swedish National Federation, incredible ticket sales and sponsorship income that went well beyond projected goals. This was no easy feat as the six FEI disciplines had never before been organized together prior to 1990. All in all, the future looked rosy for upcoming games. The WEGs at Hague, Netherlands in 1994 did not enjoy the same success as the initial Games. The then FEI President HRH Prince Philip felt that three years was not sufficient time to organize and put together the Games and his words were correct when looking back at the 1994 competitions. Organizational problems, administrative disasters, poor ticketing processes, and finally financial bankruptcy ended these Games on a poor note and overshadowing the excellent performances of the riders and horses. In 1998, Rome played host to the WEGs even though Dublin, Ireland had actually been awarded the honour prior to the 1994 games. However, apparent problems soon became a major issue and Ireland had to withdraw its support in 1996 just two years before the event. Undeterred, Rome was chosen as the new host and what they achieved is nothing short of miraculous considering that they had all systems go in just one year! These Games went off without a hitch, were financially sound and ended on a positive note! 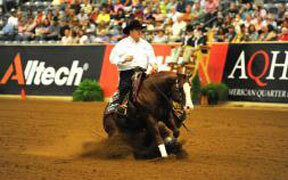 Reining: a very popular discipline added in 2002. In 2002, Spain was up front and centre and the WEGs were located in Andalusia where Jerez de la Frontera is situated and is well known for their famous Andalusian horses and equestrian tradition.These Games were a make or break situation and the outbreak of foot and mouth disease the year before was bad news for all. However, these Games proved to be a huge success and included the new FEI discipline of reining which was a popular addition to the jumping, dressage, eventing, driving, vaulting, and endurance. In 2006, the WEGs in Aachen, Germany played host to 576,000 spectators and the media couldn’t get enough of these well staged competitions. The endurance riders opened the competitions and even the drenching downpours didn’t dampen the spirits of those entering the stadium to the cheers from the spectators. The dressage competitions took a new twist as there were medals awarded for Freestyle and one for Grand Pix; it was a great success and it was clear that there was room for two champions at the end of the day. The eventing competitions without the steeplechase, but with a new organizing body with little experience were stunned at the success of their event and the spectators flooded the venue loving every minute of the tough but fair cross country course. To give an idea of the economic impact and media interest in these games, here are some impressive figures from these games from the FEI website: Actual local economic impact: $328 million; 570,000 spectators from 61 nations; 1,700 employees and volunteers; 130 judges; 76 stewards; 100 veterinarians; 965 grooms; 1,200 journalists; 300 photographers; 380 TV crew members; 70 hours of television coverage broadcast in 157 countries; 2,500 bales of straw; 5,000 bales of shavings; 66,635 lbs. of hay; 40,000 catered meals; 6,000 honorary guests; 100 hostesses; 300 service/kitchen staff; 270 exhibitors; 68 car and van service vehicles; 120 drivers. 2010: Kentucky, here we come! For the first time since the WEGs began, they were awarded to a non-European country. Kentucky, smack dab in the middle of horse country USA, won these Games, and the Kentucky Horse Park in Lexington would host all the competitions. Another first was that a lead sponsor had been found and the WEGs were now known as the Alltech World Equestrian Games. Para-Dressage was also added to these Games. Bromont: From the 1976 Olympics to the 2018 WEGs! 1.1 million meals served to spectators, staff, athletes and volunteers and112,368 cars parked. As I write this, the 2014 WEGs are still underway in Normandy, with polo and horse ball added as spectator sports. As the Games grow in popularity and as each event benefits from increased media coverage and public interest, Canada will next step into the limelight when the 2018 WEGs are held at Bromont, Quebec. Site of the 1976 Olympic equestrian events, and countless subsequent and national and international events, Bromont was denied the games after their initial bid due to queries about financial backing but on June 9th of this year after a meeting in Lausanne, Bromont was awarded the Games winning over Kentucky. Bromont will once again get the chance to shine and strut her stuff in four years! See you there… à bientôt!